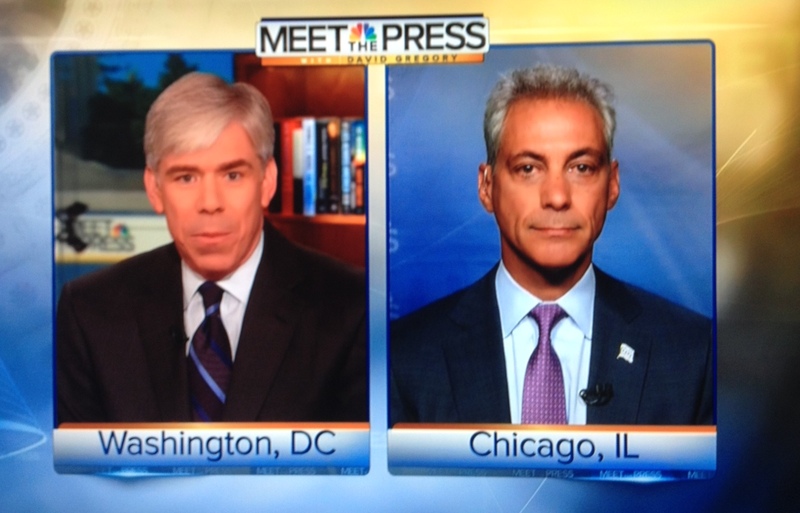 Today’s broadcast opened with Chicago Mayor Rahm Emanuel, former chief-of-staff for President Barack Obama. Emanuel said last week’s Republican National Convention was like “Groundhog Day,” all the same old policies we have heard before. The only reason people are still talking about Clint Eastwood’s speech, according to Emanuel, is that there was nothing of substance in the speech from Republican presidential nominee Governor Mitt Romney (R-MA). Emanuel was very strong in pushing the idea that this election should be about a choice between two philosophies, not a referendum on President Obama’s performance in his first term. On the “welfare to work” program, Emanuel gave a passionate defense of this program he helped draft with then President Bill Clinton and a defense of the changes to the program President Obama is making. At the request of Republican governors, the president is allowing states more flexibility in how they move people from welfare to work. In fact, this is an area where Democrats and Republicans have worked together to improve a program, and there is evidence that this new flexibility is moving more people from welfare to work. Yet now we see TV ads where Republicans are using this issue to beat up on the president and claim he is trying to end the work requirement for welfare. No matter how many times Politifact or FactCheck says these ads are false, they keep running. Next up in the roundtable (see my note below), former Speaker of the House Newt Gingrich (R-GA) took issue with the Groundhog Day comparison saying that Republicans believe in free enterprise, balancing the budget, and moving from welfare to work, and yes, these ideas have been around for a long time. Gingrich also added that this coming week, the Friday morning jobs report will be more important than President Obama’s Thursday night speech. NBC’s Tom Brokaw said voters are like Cuba Gooding, Jr. crying “Show me the money!” People feel betrayed over the last 12 years (not just the last four), and now it is like they can’t believe anything anymore. “It always seems to be a bait and switch,” said Brokaw. It is unfair to say Mitt Romney was not specific, according to the New York Times‘ Tom Friedman. “Romney said he is going to balance the budget, cut taxes, raise defense, protect medicare, and preserve all of the institutions of the federal government we need from the FBI to the FAA. He can’t possibly do all those things. That was my problem. How does the math add up? He is still at war with math,” said Friedman. Historian Doris Kearns Goodwin was also on the roundtable. I like her. But what I heard from her was, “Truman, Lincoln, Speaker Rayburn, pigeons, Liberty Bell, Ike, Eleanor Roosevelt, etc.” She even sang a little. Moving on. Friedman said the one big mystery to him is why President Obama never leveraged his popularity with the American people to get things done. Brokaw pointed out that the Republicans can make a very good critique of the last four years. But they screw up the message by over-reaching. The two examples he gave were when vice presidential nominee Paul Ryan blamed President Obama for the closing of the Janesville, WI General Motors plant when it really happened during the Bush Administration, and when Ryan criticized President Obama for not supporting the Simpson-Bowles debt reduction plan when Ryan himself was on that commission and voted against it. The second half of the roundtable descended into something about abortion and Congressman Todd Akins (remember him? ), and it seemed oddly disconnected to the presidential race. The producers need to make sure this doesn’t happen again. Well, the Democratic National Convention opens Tuesday, and my hope for balance was not fulfilled. Last week their were three current or former elected GOP officials: Senator John McCain (R-AZ), former Governor Jeb Bush (R-FL), and Governor Jan Brewer (R-AZ). Plus they had one paid strategist from the Republican party, Mike Murphy. With them, there was one Democratic elected official, Congresswoman Debbie Wasserman Schultz (D-FL). The show included one journalist, NBC’s Chuck Todd. Today, on the eve of the DNC, they had one elected Democrat, Mayor Emanuel, along with two Republicans, Gingrich and Carly Fiorina, vice chair of the National Republican Senatorial Committee. Also included were journalists Friedman and Brokaw along with historian/singer Goodwin. Emanuel seems like a good balance to the McCain appearance. Jeb Bush appeared as a bit of an iconoclastic Republican who many think could be a presidential nominee someday. Maybe Governor Martin O’Malley (D-MD) would have been the equivalent? For Mike Murphy, they could have chosen James Carville or Hilary Rosen. And for Governor Brewer, maybe Governor Bev Perdue (D-NC) would have been a good choice, especially since North Carolina is hosting the DNC? The point is that a little creative thinking could have made the show appear more balanced. More importantly, it almost certainly would have generated a better conversation than we saw today.